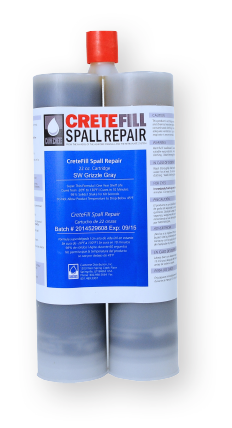 CreteFill Spall Repair | 22 oz. Cartridge – Curecrete Distribution, Inc.
CreteFill Spall Repair, when combined with sand or fly ash, will develop into an extremely strong polymer concrete designed to repair existing concrete that has been damaged by forklifts, steel wheeled carts, etc. CreteFill Spall Repair is a rapid setting, high strength, hybrid urethane repair material. This two part, 1:1 system is 100% solids and designed for repairing damaged control joints and larger cracks where no future slab movement is expected. CreteFill Crack Repair EZ Shave is designed for rapidly and structurally filling cracks in concrete. It offers slight flexibility for ease of shaving. 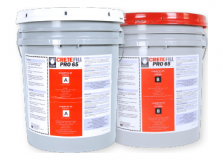 CreteFill Pro 65 is designed to fill damaged control joints, or new control joints on horizontal concrete. It is slightly flexible, yet strong enough to protect the vertical edges of concrete from spalling. 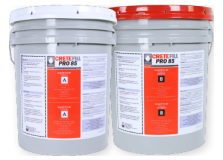 CreteFill Pro 85 – Moisture Insensitive is designed to fill damaged control joints, or new control joints on horizontal concrete. It is slightly flexible, yet strong enough to protect the vertical edges of concrete from spalling. FAQ: Does Ashford Formula cover up blemishes and flaws on the concrete surface? Copyright © 2019 Curecrete Distribution, Inc.